Astronomers at Arizona State University have used NASA’s Lunar Reconnaissance Orbiter (LRO) to build this jaw-dropping map of the Moon. It’s the highest-resolution, near-global topographic image of our lunar neighbour yet. 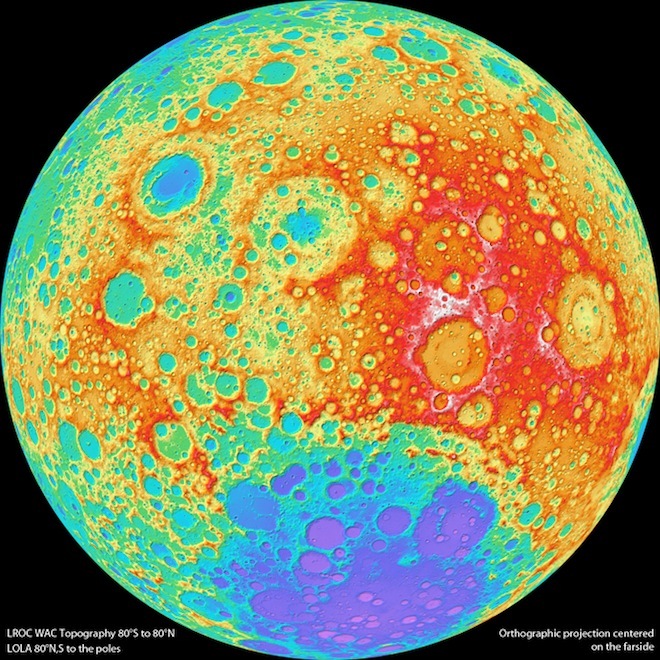 The map reveals the Moon’s surface shape, and uses different colours to represent the elevations of the craters, miniature mountains and ridges that dot the surface. White parts are highest, down through red, orange, green, blue and violet, which represents the deepest pits. The entire map in all of its glory, which is dubbed the the Global Lunar DTM 100 m topographic model (GLD100), shows almost the entire moon with a scale close to 100 meters per pixel. The map was created with the orbiting probe’s Wide Angle Camera (WAC), a tiny photographic device that can fit in the palm of your hand. But despite its petite body, it can capture a high resolution shot of the Moon with a 70km swath. Because the equatorial distance between orbits is about 30km, the WAC can build a new picture of the Moon every month. That might sound like overkill, but because the Moon’s lighting changes every month the WAC can build a record of how different rocks reflect and shade the light, to build this 3D topographic atlas. The little camera can’t quite do it all by itself. The poles of the Moon are in almost perpetual darkness, so the WAC can’t complete the map at the highest latitudes. But never fear, because the LRO’s Lunar Orbiter Laser Altimeter (LOLA) excels at scanning the topography of the poles, it can fill in the gaps. “Our new topographic view of the moon provides the dataset that lunar scientists have waited for since the Apollo era,” said Mark Robinson, Principal Investigator of the Lunar Reconnaissance Orbiter Camera (LROC) from Arizona State University, in a press release. The WAC was built by Malin Space Science Systems in San Diego. A very similar camera from the same firm, called the the Mars Reconnaissance Orbiter (MRO) Mars Color Imager (MARCI), is currently orbiting Mars.